A friend shared a story of how she encouraged the men in her workplace to take Family Medical Leave when they and their partners had new babies. Her argument was two-fold. First, she said because California was one of the handful of states that actually had policy to support new parents to take six weeks off to bond with a newborn baby, adopted, or foster child, the men COULD take this time off, be with their families, and still receive partial pay. Second, she said that men SHOULD take this time off because when they don’t, they inadvertently push women – who are often the primary caregivers and have little choice but to take time off work – further down the employment opportunity ladder. I found her story incredibly provocative, and had never before made the link between how men and women use Family Medical Leave and the effect on their careers. 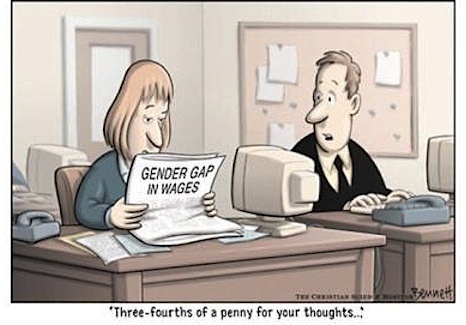 Recently, the New York Times ran an article on the wage gap between men and women in the United States based on data collected for the 2009 American Community Survey. It showed how, still to this day, men are out earning women in every American state. So, maybe my friend has a point. Family Medical Leave policies are intended to benefit and strengthen families. Yet, many of us probably know at least one woman who did not take the full time off available to her because of fear that she will fall behind at work or get passed up for promotion upon her return. Such fears must stem from their reality that even when we have a policy in the books that say we can take time off to nurture our families, it is still a difficult choice for parents to make. This seeming paradox makes me think that we can’t solely depend on policy to provide the solutions we are looking for. Policy change is an important step – yes, but we need to look at how we must influence culture and society to make sure people can truly benefit from the changed policy. Hooray to California for being the first state to institute a policy that supports strong families, but clearly, we have a long way to go. Are cell phones the cigarettes of our generation?